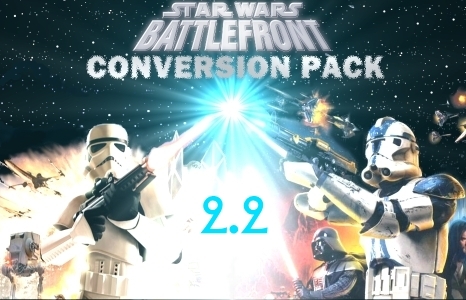 The Conversion Pack is a comprehensive add-on to the original Battlefront II. It adds 25 new maps - including all of the maps from Battlefront 1 not originally featured in Battlefront 2, 5 new gamemodes, a new era, and a substantial amount of expanded unit content to the original game. This is the first public patch to the Conversion Pack 2.0. A list of changes will be made available in the related news post as well as in the download itself. 1) You must have Conversion Pack 2.0 installed and working. 2) Autoinstall to "GameData" directory or manually extract to that directory. 3) Confirm correct installation by checking to see if "patch.lvl" and "patch2.lvl" are in the “Star Wars Battlefront II\GameData\addon\BF1\data\_LVL_PC\SIDE” folder. 4) Once properly installed, please read notes and changelist included in “Star Wars Battlefront II\GameData\ConPack2.2PatchChanges” folder. Please read the installation instructions above. This mod does nothing that could cause instant action to be unselectable. You will need to clarify what your issue is or no one can help. I also have problems when trying to play instant action, I can select maps, but if the map is not original, or it is from anothermod, it closes Battlefornt and opens a window saying "Fatal Error"
I know know feeling general! My theory is that when some people re-post mods from one site to another they probably leave out a modbreaking feature. hope this helped. Killa,could you play before?And are you using windows 7/vista? TIME TO END THIS COMMENT STRAIN! Nothing is funny here so far. there are no instructions figure it out. your game crashes DEAL WITH IT it happens. and No more Guests its so easy to make an account. Just in case, the instructions are actually in the Description if you press the 'Read More' button. We have traveled so far since 2009. Hope this helps, open up your folder with your mod There should be a three letter folder such as 1bn or ADG Copy that then go to windows cdrive progamfiles86 lucasarts swbf2 gamedata then put it in your addon folder. If you don't have an addon folder create one. But if you have Steam version you do the same until you get to program files 86 but then go steam steamapps common swbf2 gamedata create addon and drop 3 letter/number. when you open your folder it might just say things like data readme and srict, that means that your 3 letter or number phrase is your mods name. if you have steam version and need help with a setup wizard all you do is change the location from lucasarts to steamsteamappscommonswbf2gamedata! Awesome mod, dudes !!! Also can I add one suggestion ? Revan's fighting animation is great but a little bit frustrating. They're not really "handy". He would work better with Kreia's (not Darth Traya, just Kreia) fighting anims. Is the Galactic Conquest increased? I mean is it possible to play via GC on some of the new Maps? Original there are some "empty" Star Systems that could be used for that. An other Question. Are the Dead Heros still in? I mean Jango and Maul that are'nt alive in the Clone Wars era. Ventress and er Durge where good candidates to replace them. where do u think i can buy star wars battlefront 2????? You can buy the game on steam. This mod is great. That is all. Who knows a mod where is possible to use some heroes in the Space maps? Really awesome, but for some reason it comes up with AB1~ under instant action instead of alderaan and the same codes for all the newly added maps. may need some tweaking, and playing certain maps in certain eras crashes the game to desktop, Concord dawn especially does it. I get the same thing. Is there anyway to fix this? It's really ANNOYING. do bots work for this? Ok gonna give this MOD a shot, i know the game may be old, but its an epic game since i got it for the ps2, now i have it for my pc. Will let you know how it pans out. Hi, I had a question about the Convo pack, On win7 it crashes to desktop whenever I load one of the Pack's maps, like bespin, or alderaan. Is there anything I can do to fix that? The original BF2 maps work fine. Thanks! this mod crashes to desktop whenever i try to launch a campaign, galatic conquest, or instant action playlist. I'm using windows 7 if that helps. PLEASE HELP!! !